Trust Sears Maid Services to get your house, apartment, or condo sparkling clean. Our local teams of professional cleaners can provide cleaning services to you and your business on a weekly, biweekly or monthly basis. Our expert house cleaning technicians offer you peace of mind along with a sparkling home or business. We clean areas from kitchens to hallways and bathrooms and pay attention to the areas where dust is most prevalent. Give us a call at (724) 439-1587. Sears Maid Services takes pride in offering superior house cleaning services on a schedule that works for you. Whether you are looking to establish a regular cleaning schedule or require a one-time cleaning, we can help. We offer weekly, bi-weekly, and monthly cleaning services to facilitate busy schedules. For that one-time clean, whether you are selling your home or are in need of a good spring cleaning, Sears Maid Services offers an intensive Deep Cleaning service. This extensive service includes all of our normal cleaning services with additional services offered for hard-to-clean areas. There is a direct correlation between a clean office environment and customer satisfaction and employee morale. Sears Maid Services works hard to ensure your place of business is accurately represented by providing superior commercial cleaning. At Sears Maid Services, our commercial cleaning experts ensure that high traffic areas, kitchens, hallways, waste baskets, and more are taken care of. After all the fixtures and fittings are installed and the drywall has been hung, it's time to prepare the newly constructed home for viewing. You can trust your post construction cleaning to Sears Maid Services. We can help you realize the most potential by ensuring the home shows well to potential buyers, vendors, and real estate agents. 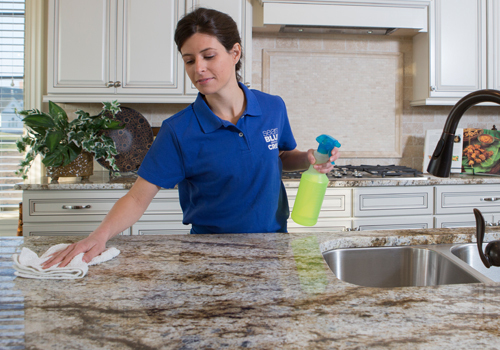 Our professional cleaning staff is available to mop, vacuum, sweep, sanitize all surfaces, and remove dust and debris. Sears Maid Services knows that it is difficult to allow unfamiliar people into your home or business. We work hard to build trusting relationships with each and every client and we vet every potential employee through extensive background checks prior to hiring. Each employee then receives continuous on-site and off-site training to ensure they are fully trained with the necessary skills to deliver superior service. We're so confident in the level of service our professional house cleaning experts can provide that we put it in writing. All of our services are fully guaranteed. If you are not completely satisfied with Sears Maid Services, let us know within twenty-four hours of the last scheduled cleaning. Describe the discrepancies and we will send an inspection associate out to your location at no extra charge to you. If there is something we missed, we will return at a time that works for you to put it right.